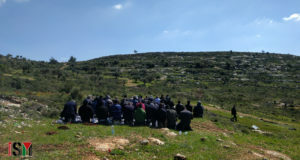 Around 12:30 on Friday, 140 Ni’lin villagers, together with international and Israeli solidarity activists, gathered after the prayer to demonstrate against the Apartheid Wall. The march went through the fields of Ni’lin and reached the wall site without incident. The Wall was finished in May 2009 as an electric fence with video cameras and a road where the army patrol. Although it seems finished, last Monday Israeli forces began adding 8 meter high blocks of concrete. Right after the demonstrators have reached the wall, several army jeeps started shooting, using the multiple tear gas machine. Israeli soldiers kept shooting tear gas grenades from the road at the demonstrators and eventually they came into the fields through a Wall gate and threatened the protesters with live ammunition guns. All internationals and Israelis left around 5pm, although the demonstration went until 7pm. During the time that there were just Palestinians in the fields, Israeli soldiers used the high velocity tear gas projectile and live ammunition. The high-velocity tear gas canister was not used in Ni’lin since the end of May when Basem Abu Rahme, a Bil’in demonstrator was murdered with one. In total, 38 people have been shot by Israeli forces with live ammunition in Ni’lin: 9 were shot with 5.56mm caliber live ammunition and 29 were shot with 0.22 caliber live ammunition.